Goodreads says, "This is the classic tale of boy meets girl: Girl…goes home with someone else. Meet Eve. She’s a dreamer, a feeler, a careening well of sensitivities who can’t quite keep her feet on the ground, or steer clear of trouble. She’s a laugher, a crier, a quirky and quick-witted bleeding-heart-worrier. Meet Ben. He’s an engineer, an expert at leveling floors who likes order, structure, and straight lines. He doesn’t opine, he doesn’t ruminate, he doesn’t simmer until he boils over. So naturally, when the two first cross paths, sparks don’t exactly fly. But then they meet again. And again. And then, finally, they find themselves with a deep yet fragile connection that will change the course of their relationship—possibly forever. Follow Eve and Ben as they navigate their twenties on a winding journey through first jobs, first dates, and first breakups; through first reunions, first betrayals and, maybe, first love. This is When Harry Met Sally reimagined; a charming tale told from two unapologetically original points of view. 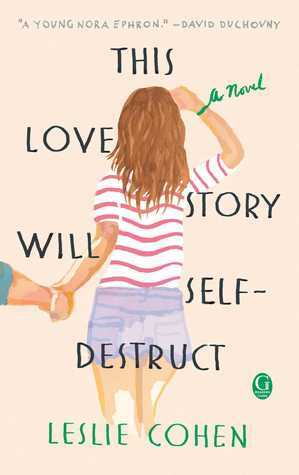 With an acerbic edge and heartwarming humor, debut novelist Leslie Cohen takes us on a tour of what life looks like when it doesn’t go according to plan, and explores the complexity, chaos, and comedy in finding a relationship built to last." Eve Porter has been through a lot. Her mother died tragically and her father left her and her sister when they were young. Due to this, she spends a lot of time worrying and observing things in order to protect herself. She dates a lot of toxic people and when she meets Ben, she assumes he is too nice, too boring, and far too perfect for her taste. But as the years go by, she runs into Ben again as they share some of the same college friends and there's definitely something there. Can Eve let herself date a "normal" guy? Can she allow herself to be happy? 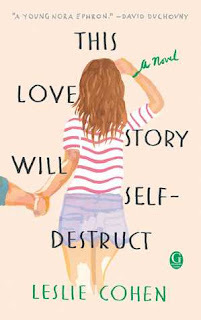 This novel is very reminiscent of When Harry Met Sally, which is one of my favorite movies, so I thoroughly enjoyed This Love Story Will Self-Destruct by Leslie Cohen. Eve felt like such a real character to me in This Love Story Will Self-Destruct. Her issues were all real and easy to relate to. I know so many people that self-sabotage, so I think that her story will be resonate with many. I didn't always agree with Eve's choices and she frustrated me at times with her ability to self-destruct, but I was rooting for her. I wanted her to have her happy ending. Her friendship turned relationship with Ben was so well done in This Love Story Will Self-Destruct. I loved every aspect of it. As I said, if you adore When Harry Met Sally, you'll appreciate their relationship even more so. I loved how it was rooted in friendship and it felt so real. Ben is such a good guy and some of their discussions had me laughing out loud. The issues that they deal with - college friends, crazy family members, past relationships, betrayals, first jobs.... it all felt very real, especially when trying to navigate the confusing times of your twenties. Leslie Cohen is definitely a debut author that's definitely on my radar. I really enjoyed her writing style and her ability to bring New York City to life in addition to such memorable characters. This Love Story Will Self-Destruct will definitely make my "Best of 2018" list at the end of the year. I loved it! I've been looking forward to this one for awhile, so I'm glad to hear you loved it so much! I hope you like it! I look forward to your thoughts as well. Thanks for visiting, Angela. I will be putting this on hold at the library. Thanks for your review and recommendation! I can't wait to hear your thoughts, Christina! I hope you enjoy it. Thanks for visiting!